Today am going to review a new lip balm which is perfect for this summer. Its Kronokare The Frizz Kiss Cooling Explosion Lip Balm. I have used two tubes of this – once I got in Fab Bag and another in Envy Box Lashes & Pout Edition. So let’s move on to the review without further due. Repairs damaged tissues and leave your lips looking morning-dew fresh. Our super rich vitamin E lip balm is a delicious mix of peppermint, shea butter and sunflower oil, which seriously restores tired tissues and keeps your lips cool until the next kiss. The lip balm comes in the old school packaging of Himalaya and Vaseline lip balms. A squeezable tube with a slanted tip. The product consistency is such that it can’t be put in a regular retractable lip balm tube as its not much solidified. Kronokare The Frizz Kiss Cooling Explosion Lip Balm has a translucent, gel like consistency. The consistency resembles the Himalaya lip balm. It has a mild fragrance of menthol. 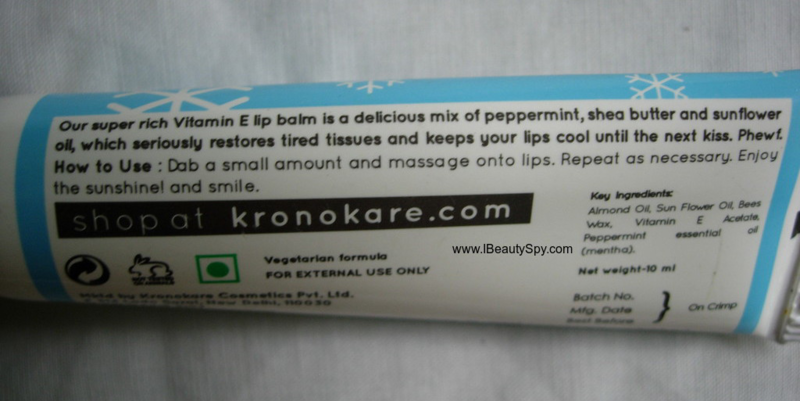 Kronokare The Frizz Kiss Cooling Explosion Lip Balm gives a slight cooling sensation to the lips on application due to presence of peppermint essential oil. It lasts for few minutes and fades away. The lip balm leaves a glossy shine on the lips which stays for an hour or so. For those who prefer matte lip balm to go under lipsticks, this might not be a good option. Kronokare The Frizz Kiss Cooling Explosion Lip Balm immediately smooths and hydrates lips. It heals dry and chapped lips with continuous use. However, if you have extremely chapped lips, it might not help. The best part about this lip balm is that it is completely free from parabens and silicones. But the ingredients list and claims are confusing. The product claims say that it contains shea butter but the ingredients doesn’t list it, only beeswax. Kronokare The Frizz Kiss Cooling Explosion Lip Balm is very affordable. If you are looking for a pocket-friendly lip balm which is free from parabens and silicones, then you can give this a try. Yes, it satisfies all its claims. Repairs damaged lips and keep lips cool. * Smooths and hydrates lips. * Gives a fresh, cooling sensation on application. * Does not help extremely chapped lips. * Confusion in ingredients list about presence of shea butter. Yes, it is a good option for summers. But for winters with very dry weather, it might not be enough. It’s affordable and worth the money. Overall, Kronokare The Frizz Kiss Cooling Explosion Lip Balm is a good lip balm to try this summer season. It gives a nice cooling sensation and smooths and hydrates lips. However, it might not be suitable for winters when our lips become extra dry and very cracked and chapped. Just wanted to tell you that I nominated you for a blog award 🙂 Do read,to write or not is your choice.